Have you ever heard of a moonlight garden? Have you ever noticed how magical everything looks at night after a snowfall? Moonlight mixes with snow, and the world seems to glow. 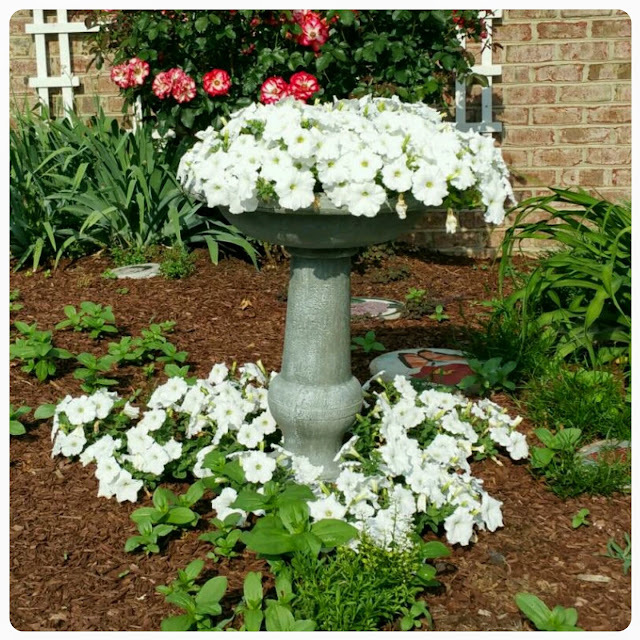 Here is a re-purposed bird bath, filled with white Wave Petunias (annuals). The birdbath is made of resin. I have had it for about five years, leaving it out year round. It finally cracked and instead of tossing it out, I decided to plant flowers in it! I planted about four white petunias around the base. The petunias cascade over the side of the basin and it looks as if they have spilled over on the ground. In the moonlight it looks especially beautiful! They take on a glow all their own. Containers are great for planting annuals. This one is on the brick sidewalk at the coop. 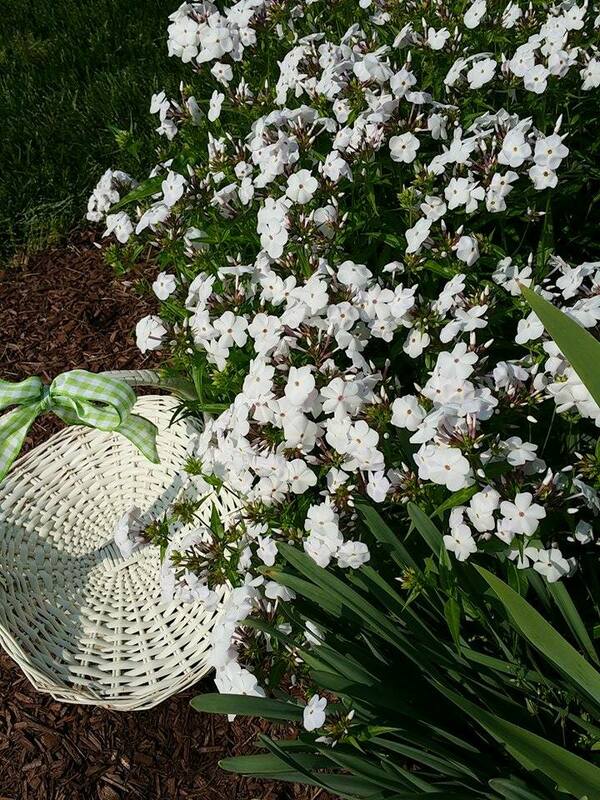 Our coop is white, and I think the white flowers are complimenting. A mix of green and white in the garden is cool, clean and crisp! 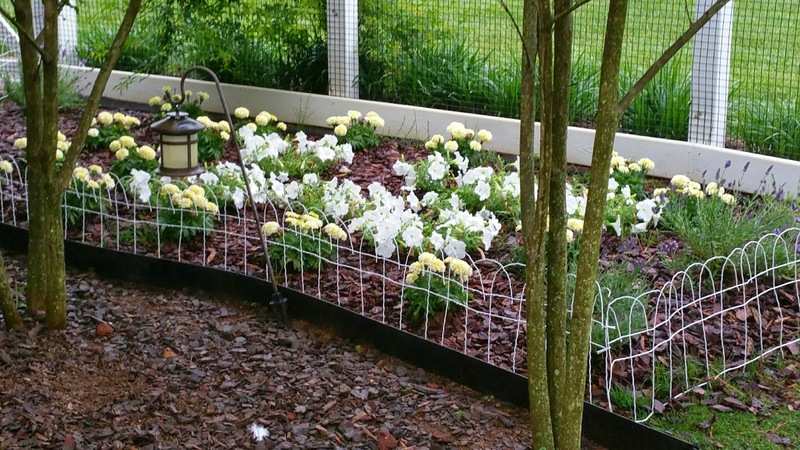 This is a bed of white wave petunias and creamy white marigolds. Wildflowers! 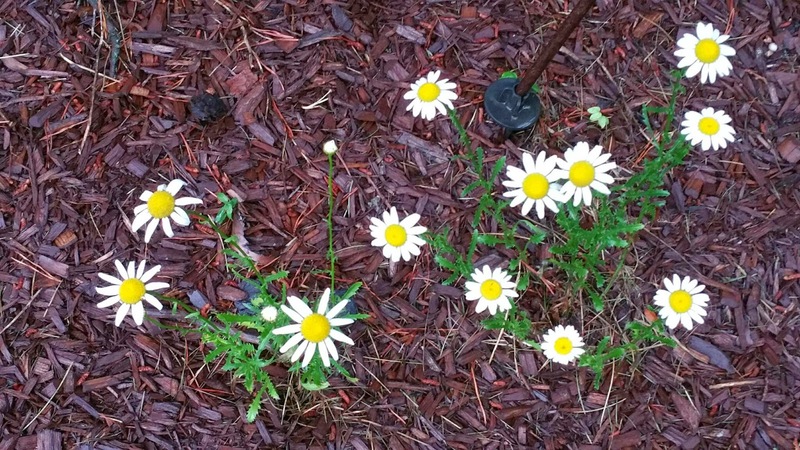 Aren’t they beautiful with their white petals and yellow centers? 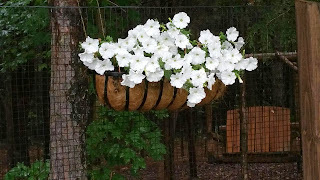 I planted the hayrack with white Wave petunias as well. This hangs on the fence of the chicken yard! I like to have pretty flowers and things out by the coop! It makes everything look pretty and makes for a pleasant place to sit and enjoy the flock! 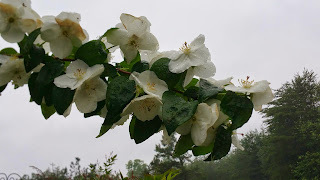 This is a mock orange bush! It has a heavenly fragrance! Don’t forget perennials when you are planning your moonlight garden! 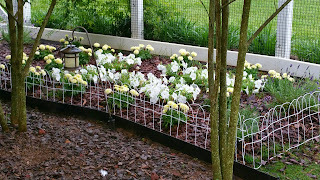 There are many perennials that bloom in white! 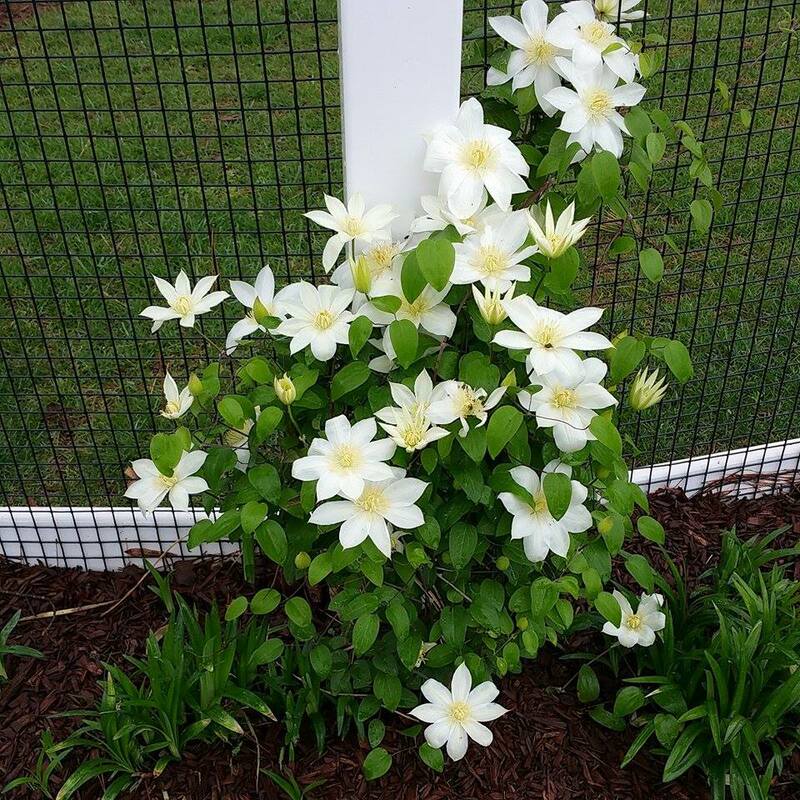 Plant white perennials that will bloom from spring to frost! 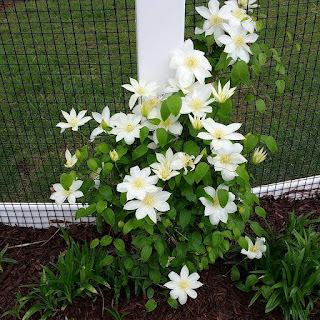 The picture on the left is a white clematis (perennial) that I planted on the fence of the coop yard. I love to plant perennials! It is always exciting to see them emerge, grow and bloom in the spring! On the right is tall white phlox a (perennial). I planted it in a bed at the corner of our garage. It has a wonderful scent and is a delight to see as I pull down the drive! Here is a short list of white flowers to use in your moonlight garden. 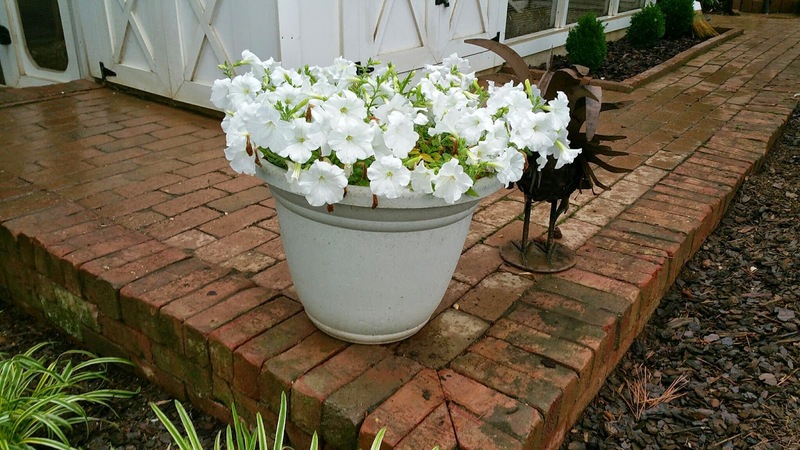 Many can be planted in the ground as well as used in container gardening.